The Presidency has released a full list of all the appointments made by President Muhammadu Buhari since he assumed office on May 29, 2015. 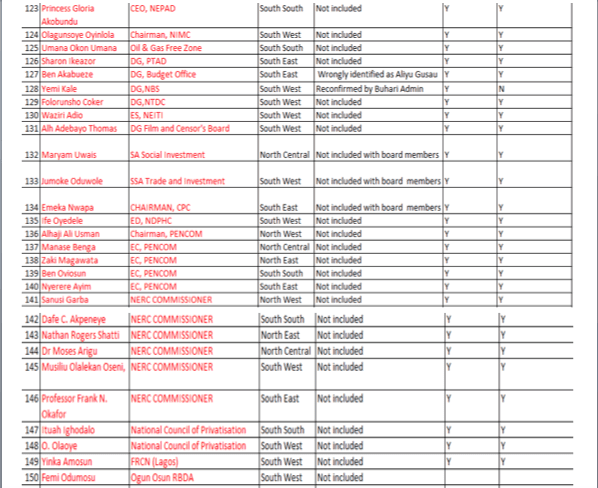 The Special Adviser to the President on Media and Publicity, Femi Adesina, released the list of 159 Appointees on Saturday night, a copy of which his office emailed to PREMIUM TIMES. 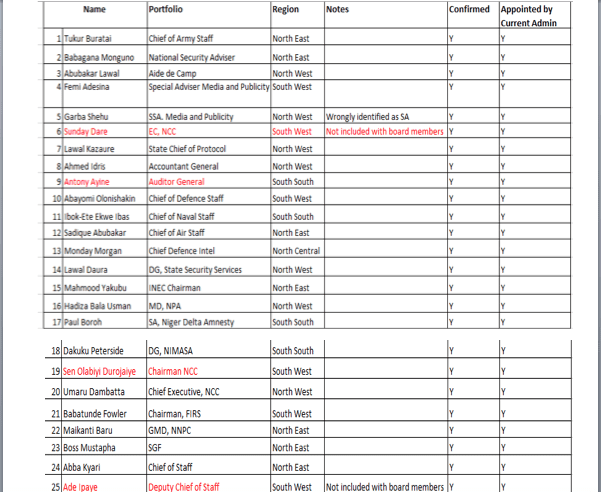 “Here is an updated table of President Muhammadu Buhari’s appointments, disproving the allegations of lopsidedness,” the presidential spokesperson said while forwarding the list to journalists. 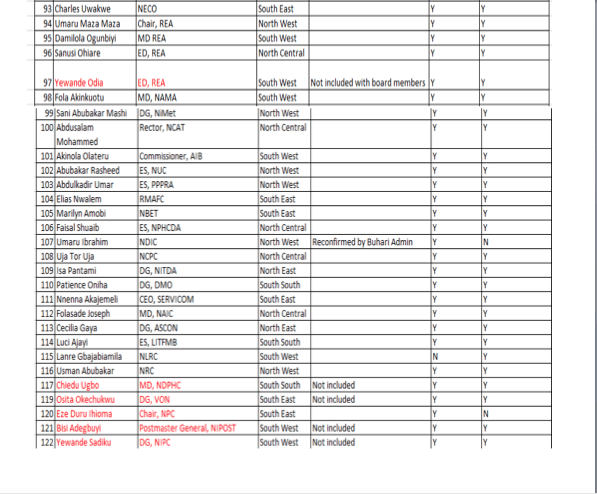 Mr. Adesina had earlier on Saturday released a graphical representation of the appointments in response to a report by BussinessDay that an overwhelming majority of the Mr. Buhari’s appointees were from his native northern region. 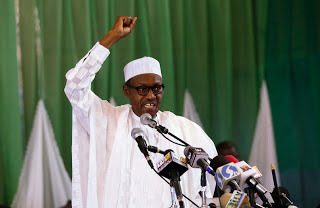 The BusinessDay report that 81 of the president’s 100 political appointees are northerners is “misleading”, Mr. Adesina, said in the statement he circulated on Saturday morning. “To claim, suggest or attempt to insinuate that the President’s appointments are tilted in favour of a section of the country is simply untrue and certainly uncharitable,” he said. The graph shows that Ogun state has the highest number of appointments with 21, followed by Imo and Kano states with 15 each, and Edo and the president’s home state of Katsina with 14 each. The Federal Capital Territory, Abuja, has no appointee — the worst case; while Ebonyi and Abia have two each, Kebbi has three, while Zamfara, Sokoto, Oyo, Enugu, Ekiti and Akwa Ibom have four each. PREMIUM TIMES has not independently verified those figures, and the list released on Saturday night. Mr. Adesina picked holes in the newspaper report, saying at least 50 appointees who are not from the north had been left out. “From all records, majority of the President’s appointees across different portfolios are not from the North, as the publication erroneously alleged,” he said. A spokesperson for BusinessDay could not be immediately reached for comments. 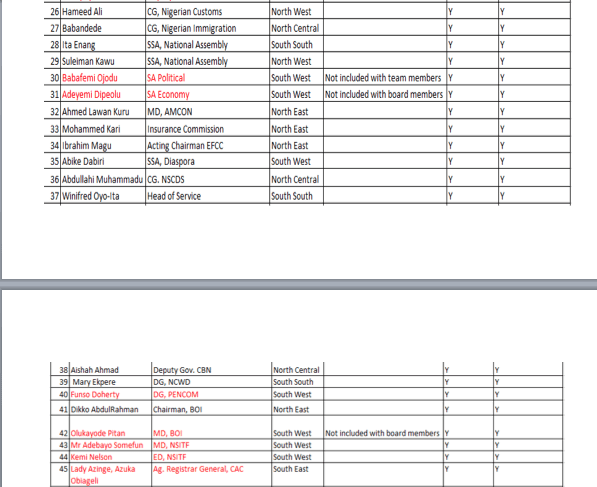 Below is a full list of appointments made by Mr. Buhari from the 36 states and FCT, as provided by the presidency.